Forex Envy is a very active expert advisor that can bring high returns. But at the same time it is a very risky tool, because the Martingale strategy is used for opening orders, i.e., it increases the size of the lot. 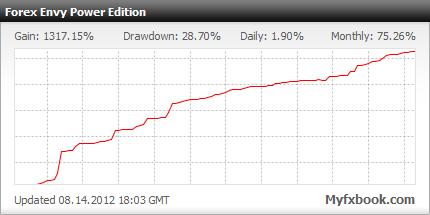 Testing of this expert adviser which has started in March 2012 until the present day, showed positive results. During these months the increment made up 14.87%, the drawdown – 28.70%, and approximately 60% of transactions were profitable. The income per day makes up to 2.5%. Such results show that Forex Envy is a machine for money making. But don't forget about the risk of losing your deposit. Developers notify in advance about the importance of compliance with certain requirements. First of all, you should withdraw the entire monthly profit, because the robot can discard all your money in no time. Secondly, you should comply with the recommended size of the deposit (360$ with a lot of 0.01 and 3 600$ with a lot of 0.10). It's also important to use the correct settings. Apply all changes only after testing them on a demo account. The EA works on major currency pairs, though EUR/JPY has shown poor results at back test. The principle of work of this Expert Advisor: It opens the orders grid at M30 for each currency pair and keeps them opened until the profit exceeds the loss, or until there are no more money on deposit. It creates a pyramid from transactions, so money is always at work. For correct operation of the robot , the terminal should be turned on since the market opening and until its closure, therefore it's recommended to use a VPS service. Note that every 3 months you will have to pay a 39$ fee for the opportunity to continue using the Advisor. 3 Demo and 3 live accounts are included in the price. If within 30 days, you decide to return the expert advisor, you should send your log file to the manufacturer. Settings should be in line with the recommended options. If you did everything correctly, but haven't received any profit, you will get 110% back.